... and a roosting owl. But let's start with the barking parrot: In a pet shop in Hiroshima, Ruby the parrot has spent so much time around dogs that she is starting to sound like one. 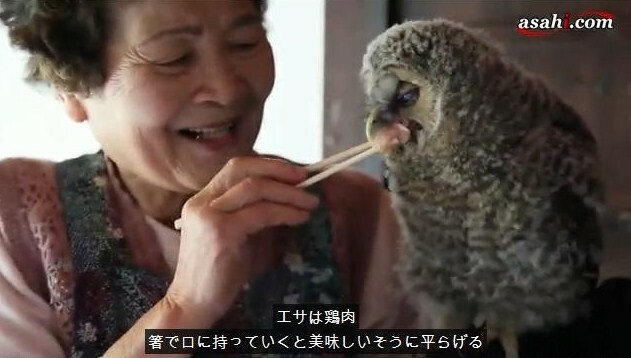 Also in Hiroshima, a woman has been raising wild owl chicks that hatch in her attic. Every year, an owl makes a nest there, deposits an egg, and then departs, entrusting the woman with the raising of the hatchling. The baby bird usually stays for about 2 weeks, enjoying the woman's indulgent rearing, then goes on its way. This has been going on every year for the past 20 years. Needless to say, she has become something of a local celebrity and receives scores of human visitors every owl-rearing season. The winged visitors, meanwhile, began showing up shortly after the woman's husband died. "It as if they sensed my loneliness," she says. Animals — how lonely we would all be without them. And now for the walking cat: In the wonderful short story "The Cat Who Walked a Thousand Miles," the titular feline lives in the Japanese capital of a thousand years ago, enjoying a blissful life there until one day, the ground begins to shake . . .